Are you looking for a New Year’s fitness resolution? Here’s a fun way to increase your fitness and trail miles. You can earn three different NCT hiking patches in 2018! One patch is specific for Pennsylvania; the other 2 are trail wide. All three are described below. The National Trails System was created by Congress in 1968, 50 years ago. From that beginning, 11 recreational National Scenic Trails (NSTs) have been established; starting with the Appalachian and Pacific Crest NSTs. Twelve years later, in 1980, the North Country NST was designated. The North Country Trail (NCT) is the longest of the 11, covering 4600 miles over seven states from New York to North Dakota. For more information on the 11 recreational NSTs visit https://www.nps.gov/nts/. The Pennsylvania Trail Council of the North Country Trail Association (NCTA) will kick off the celebration of the 50th anniversary of the creation of the National Trails System with a “PA Hike 50” challenge. Those who complete the “PA Hike 50” are eligible for a commemorative patch. The challenge involves hiking at least 12.5 different miles in each of the four Pennsylvania Chapters of the NCT. Chapters will be holding guided hikes that can help people complete the challenge. For information on the chapters and links to their hikes, visit the PA page on the NCTA website, https://northcountrytrail.org/trail/pennsylvania/. A form will be added to the page to fill out when you complete the challenge in order to receive the commemorative “PA Hike 50” patch. 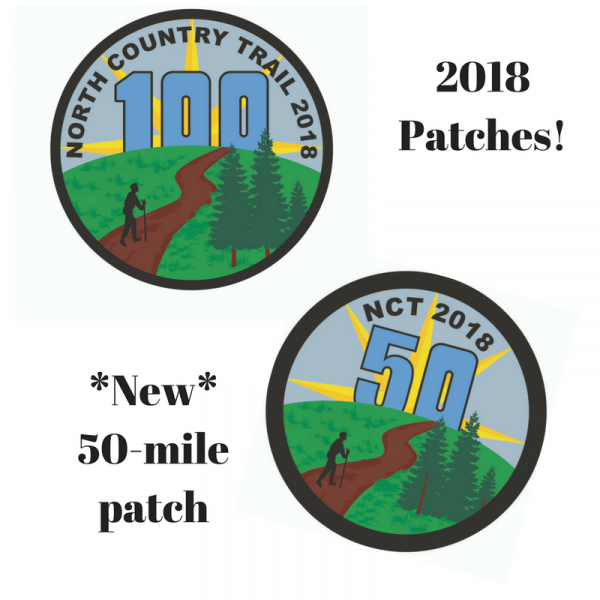 The North Country Trail Association will also offer a Hike 50 patch to commemorate the 50th anniversary of the creation of the National Trails System. To complete this challenge, you can hike any 50 miles of the NCT, even the same mile 50 times! If you complete the PA Hike 50, you can also apply for this patch. The NCTA will again be offering the popular Hike 100 patch for hiking any 100 miles of the NCT. If you achieve this challenge, you will receive both the 50 and 100 Challenge patches!